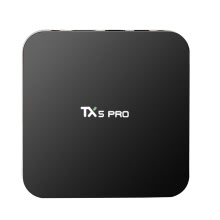 TX5 PRO Android 6.0 TV Box can changes your traditional TV or LCD Monitor into a multimedia center by connecting the Internet (Via Wi-Fi or RJ45). It can combine the Internet and the traditional TV to build a new entertainment system, letting you can greatly enjoy videos, music, photos, etc. In your free time, picking up your favorite games or choosing the wonderful movies and enjoying them on the big screen. No matter for your own or your family, this TV Box can be a nice device for leisure. Preconfigured with XBMC / KODI, numerous add-ons can be installed directly and be enjoyed by KODI fans, like YouTube, Netflix, FaceBook, Twitter, Skype and more; it also alows you to play thousands of Android games in a large screen smoothly.